There is the international style and then there are the Italians. Colour, cut and creativity combine to give the Italian man an easy elegance that is refined to the extreme. To see what I mean, please visit Kishida Days Luxury Channel Recommendation Web-Channel by Plots Men in Italy. All of which is considerably shorter in the Japanese characters. I may not understand the language, but I get what they’re trying to convey. I can’t recommend all the looks, but each is brilliantly executed, if very studied. Especially the Italian take on casually elegant. And reasons 22 and 23 to not pay heed to our Italian brethren. These are two of my go-to looks when I’m very rushed and have no time to shave. I also assume that I wouldn’t have any important business to which I should attend. Drive-through teller, sure. Walking into the bank, definitely not. What about you? Do you have a go-to casually elegant look? And, do you think that jeans can play a casually elegant role in your wardrobe? I have a perennially “good enough” pair of Nantucket Reds, a similar pair of JCrew Greens as well as jeans (Levis) that I’ve used as a casual go-to for years. Similar look to yours otherwise- navy blazer, loafers or sperry’s… but having just a classic pant that acts as a neutral is great for farmers market, junk stores, going by the stable to visit the horse… all those things that fill an “empty” day. I believe your photos have answered your own question! You impeccably demonstrate that jeans can play a casually elegant roll in the wardrobe and should slide into the background remaining secondary to the remainder of the ensemble. The mistake the majority of men make is dressing denim down with fleece, t-shirts and sneakers, giving the appearance of having just left the Home Depot or a fraternity party. Quite the contrary for those of us out of college, the secret is blending richer materials and textures so the top half and feet bookend a sophisticated contrast to the denim. Ralph Lauren is the master of this look and occasionally presents wonderful alternatives with five pocket twill and cotton pants. Another common mistake is made when the jeans become the focal point by being overstitched, bedazzled, treated, aged, too tight or long. These looks really do belong to the youth of America. A length exception can be made when you need them to ‘stack’ on boots, otherwise you just look dorky when you sit down. By all means, only wear longer jeans with boots and relegate the torn and frayed to the yard work pile. Finally, jeans should always be pressed without a crease. Again, a crease exception for our rodeo pals here in the West. I have several jeans that cost nearly as much as trousers and air dry them as mechanical drying plays havoc on the fit and life of the jean. Air drying, however, leaves them rough and wrinkled. If I wouldn’t leave the house in wrinkled trousers, why would I do so in wrinkled jeans? It takes only five minutes to press jeans and the reward is a full day of confidence. Not only is it what is worn, but how it is worn. You look great today! I like the look of the Italian, though the matted hair is rather distracting. The purple scarf works because it is tied loosely, showing the neck. Too often the scarf is tied too tightly, giving the wearer a “no neck” look. No good. I love both looks you present for yourself – and you wear the double breasted blazer well – though most men, unless very, very slender, just can’t pull it off, and should stay with the never-fail, classic one-button. I am a woman 5’3″, and love the slim line jeans, boots and gabardine blazer ensemble for cool weather. It’s an easy, reliable look to pull together fast. Definitely! 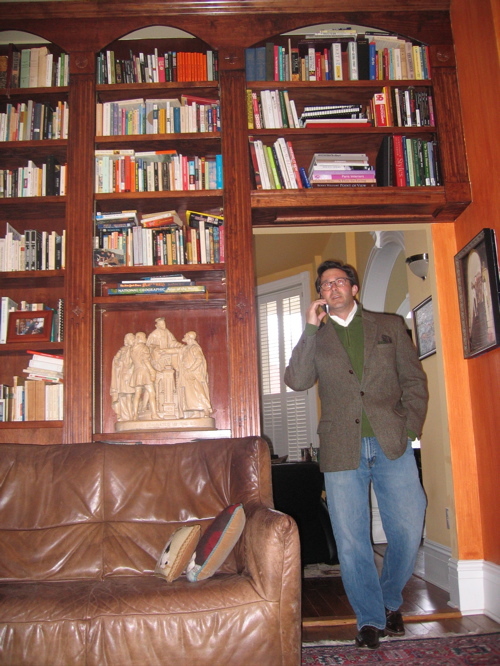 I even wear jeans – with a tweed jacket or a suede blazer – to go and see my daughters’ headmistress. Here in enlightened Edinburgh, Miss Brodie herself would approve, I feel. But perhaps your question was directed at your male readers? The tweedy/herringbone sort of jacket is one of my favorite looks on men. Is this what is referred to as a “hacking jacket?” Our college son arrives home off the plane in his Levis, a random T-shirt (he’s 21 so it works), and a similar wooly jacket which he happened to find at a consignment store, a pair of casual brown shoes, or sometimes a casual boot. It is handsome on him, and a good choice for a stage of life when a young man has little to no money. Regarding ironing jeans, I have a prejudice against it. If you wash denim in cold water, inside out, short cycle, and don’t over-spin, you can use your hand to “straighten” them, wipe out wrinkles, and hang to dry, with or without crease. My preference is not to crease. 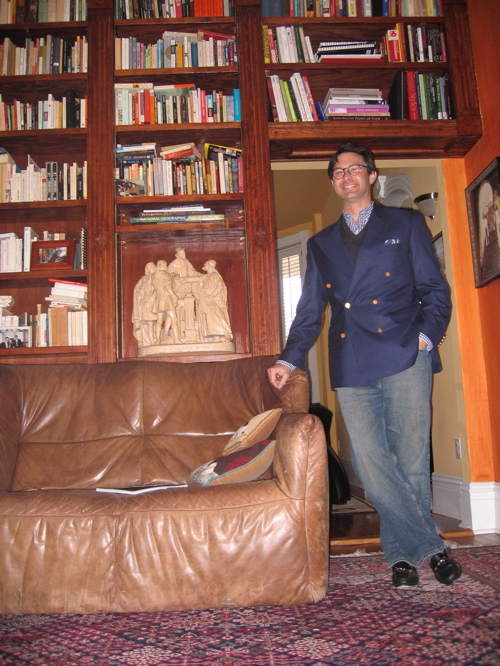 For myself, I love my skinny dark blue jeans, a brown suede boot to the knee (cool weather), a brown 1 1/2″ nubuck w/nickel buckle belt, and a fresh shirt/cashmere sweater + outerwear. Lately, I am liking felted wool jackets with patch elbows and those fabulous horn buttons. I recently wore jeans (dark blue) to a Celine Dion concert with a good white shirt, and lots of pearls of all sizes (most of which were faux), and my trusty 6 year- old classic Blahniks. Moral of the story is good jeans go anywhere for both the ladies and the gents when given some thought. So, it seems that blue jeans make the cut if properly tailored and cared for. I really like the canvas five pocket styles that are out now and frequently travel in a pair of “natural” coloured ones that work well with a pair of tan suede driving shoes. There is a shot of my traveling rig in an early post. Hardly a hack in any jacket in these photos! Well done again — upscale comfort and charm that works in so many wonderful ways! Jeans and jacket..The modern man’s uniform for Friday nights. However, the jeans should be dark and the fit should be flattering. I find that JCrew BR etc…make terrible jeans. If you are wearing jeans, Joe’s, Capital E by Levis, Evisu etc…It’s pricey but worth the money. Ditch the jeans-the outfits would look much better. If you must wear jeans-I do not-then for God’s sake don’t iron them. Danny, thank you! I haven’t bought jeans in so long I wasn’t sure where to look (these are probably 15 years old….) I’ll look into the brands you recommend. Love your look … and the Italian guy’s. I never used to be a jeans wearer – was more glam in my youth – but now have developed an avid appreciation for them and their casual chic factor that’s more in keeping with the busy lifestyles we lead. All my jeans are from the thrift shop – I buy ’em long, flared, in good condition and make sure they fit really well. I pair them with high-heeled booties and sleek 70s-inspired tops. The other day I was wearing my dark Guess? thrifted jeans with yellow 1980s Bill Blass swing coat (thrifted again) … so many people stopped me, it was very style-affirming! I like the darker jean as well. I’ve found that Lucky Brand makes a nice product – and I’m 6″4″ and they always find a pair long enough to fit me. I’ve never been a big fan over the overly faded look. Too 80’s! I found the Japanese site intriguing – although too many of the men seemed to be wearing pants of a cut and color that didn’t do a thing for them. And you have to be REALLY slim to pull off white pants. Most of those guys looked dumpy, helped along by the “above the ankle” look that certain designers seem to be promoting. Ugh. Great site, by the way. I’m bookmarking it! Welcome Westpark and thank you. Especially for your insightful comment. The site is intriguing and I find much that I can borrow from, staying within my decidedly less fashionable aesthetic of course.